Sun 7 Dec 2014 Horniman Christmas Fair. Sun 30 Nov 2014 St Clement's Christmas Fayre. Sat 29 Nov 2014 St John's Goose Green Christmas Fayre. 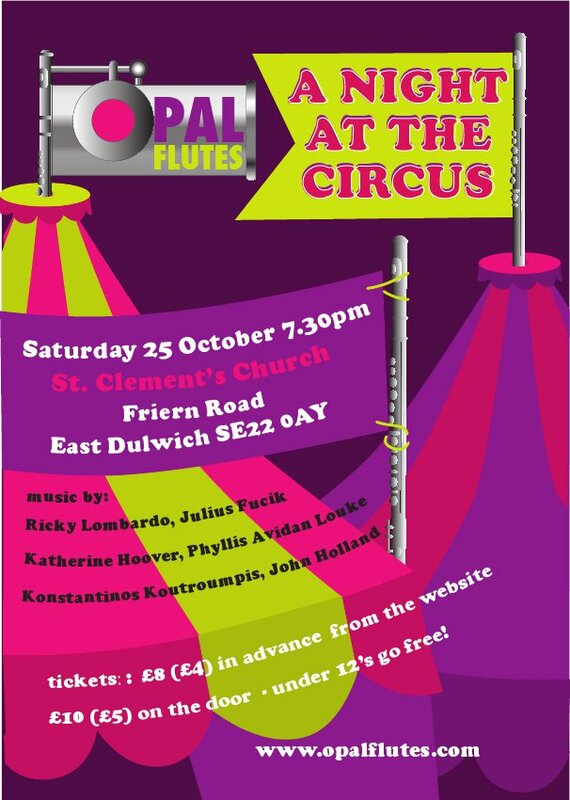 Saturday 25th October 2014 A Night at the Circus. 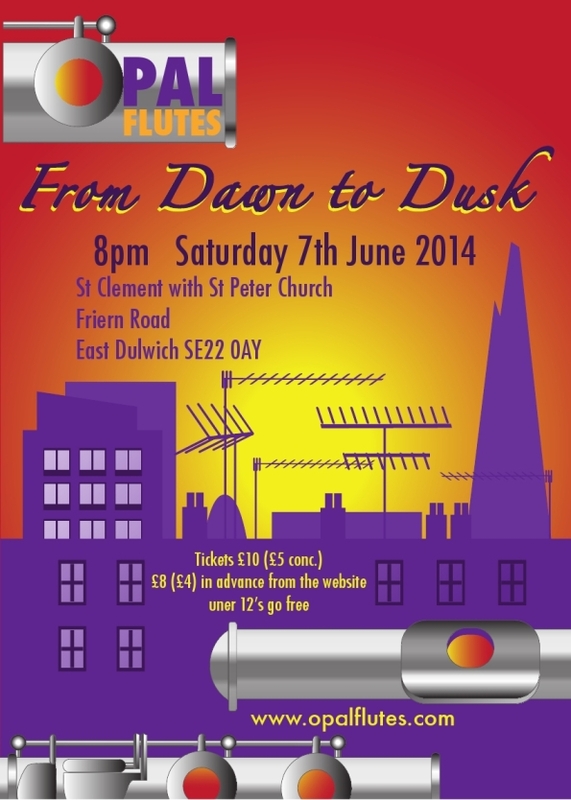 Saturday 7th June 2014 'From Dawn to Dusk' St Clement with St Peter, Friern Rd, Dulwich. 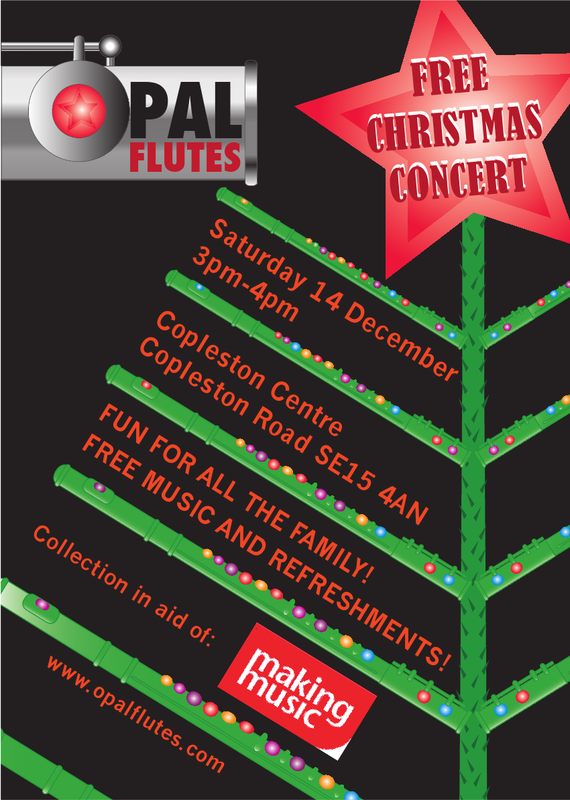 Saturday 14th December 2013 Xmas concert, Copleston Centre SE15. 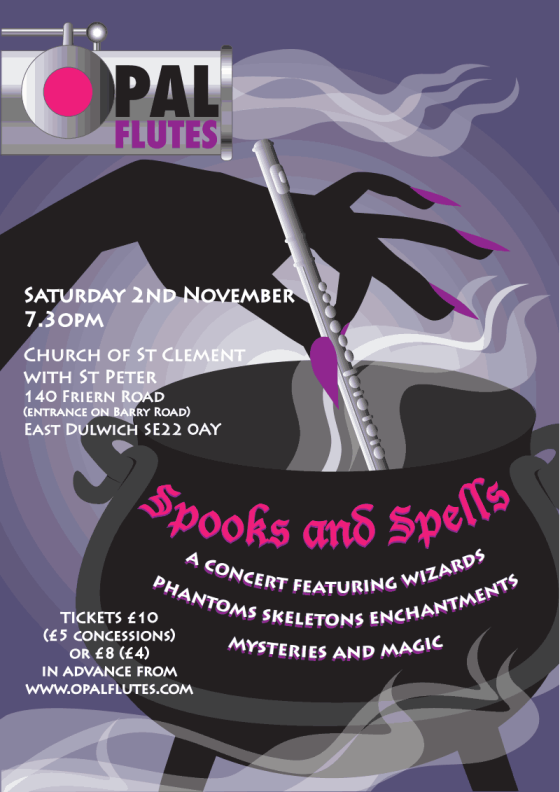 Saturday 2nd November 2013 'Spooks and Spells' St Clement with St Peter, Friern Rd, Dulwich. 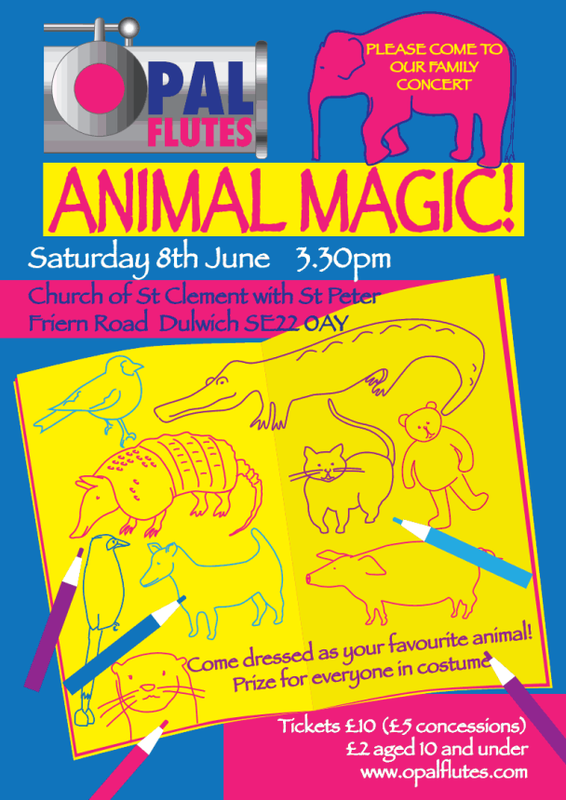 Saturday 8th June 2013 'Animal Magic'at the Church of St Clement with St Peter, Friern Road, Dulwich. 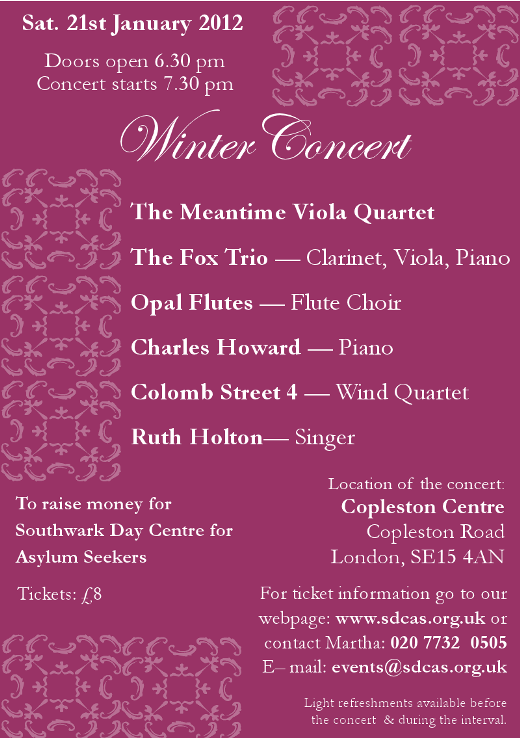 Saturday 9th February 2013 Copleston Centre, Copleston Road, East Dulwich SE15 4AN. 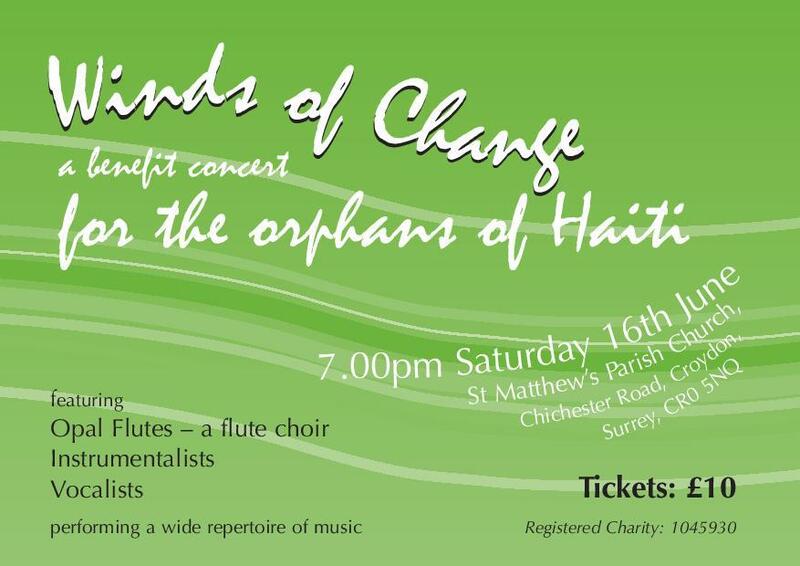 Concert to raise money for the Southwark Day Centre for Asylum Seekers. A flyer from that concert is here. 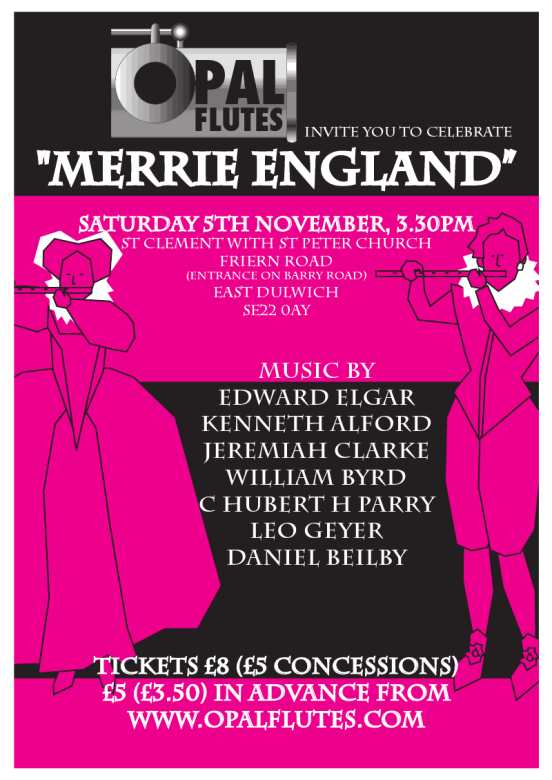 'A celebration of 'Merrie England'. 'A celebration of the past 132 years'. Saturday 11th December 2010, 3pm at the Horniman Museum, Forest Hill. 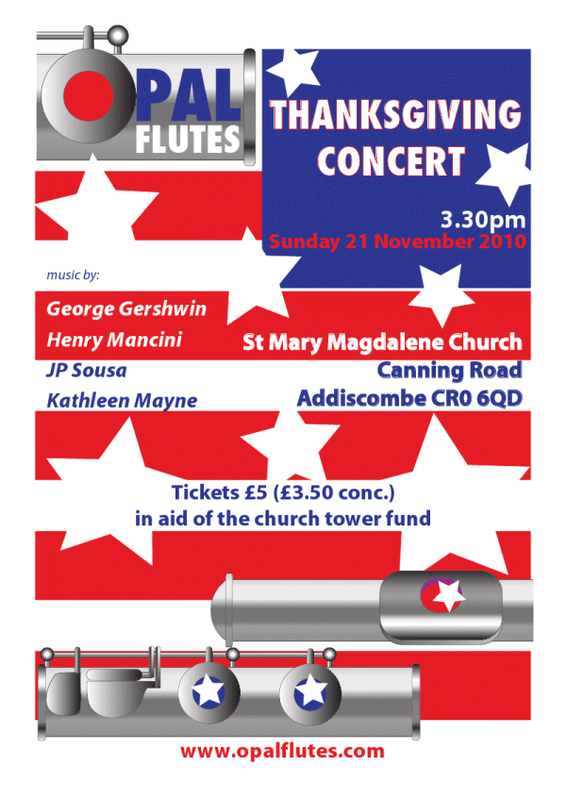 Sunday 21st Nov 2010 at St Mary Magdalene Church, Canning Rd Croydon. Thanksgiving concert. A flyer from that concert is here. The program from that concert is here. 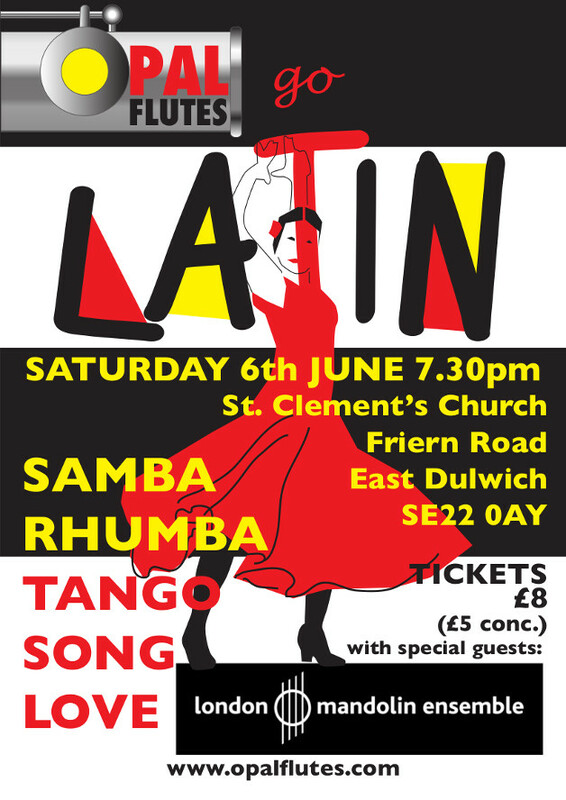 Saturday 15th May 2010 at St Clement with St Peter Church in Dulwich. 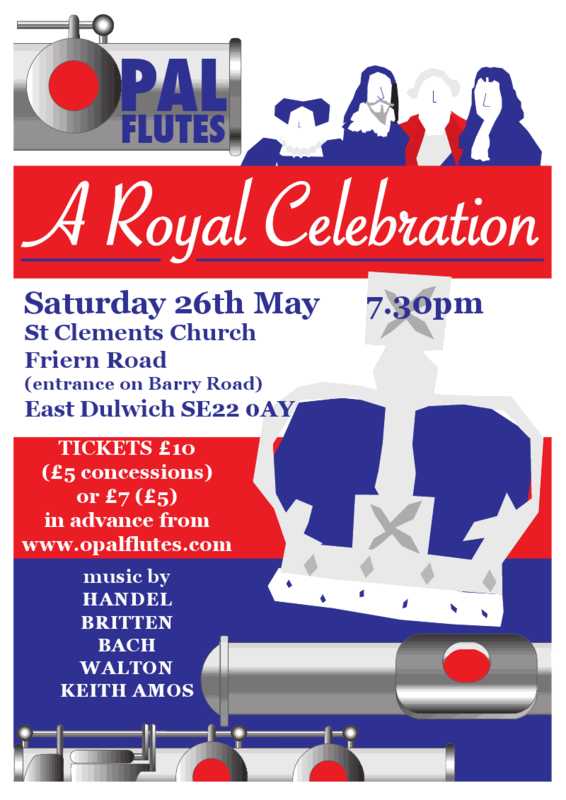 Opal Flutes presented a variety of music for flutes - from solo flute to flute choir and everything in between! 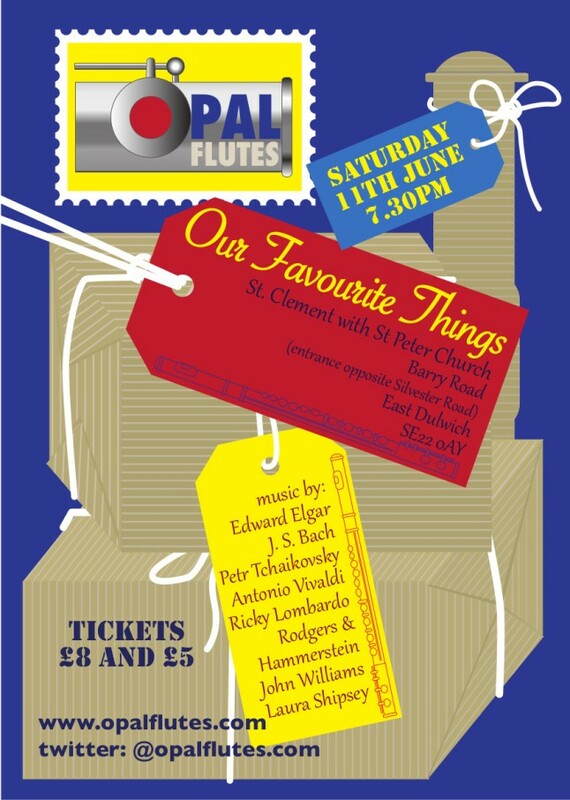 The programme included music from Vienna and Brazil, pieces by Vivaldi, Saint-Seans and Irving Berlin, and new works by John Holland, Martin Jones and Michael Regan. Photographs are here. A flyer from that concert is here. 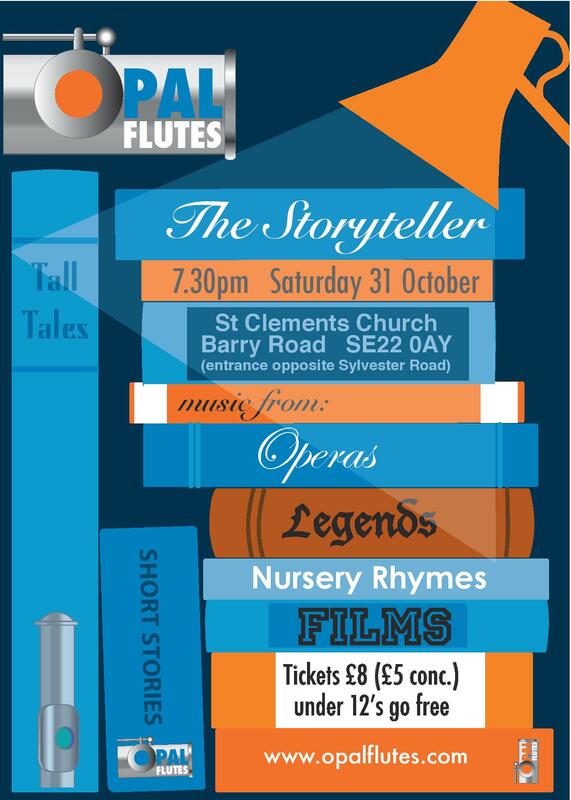 The programme from that concert is here. Saturday 12th December 2009 once more at the Horniman Museum, Forest Hill. 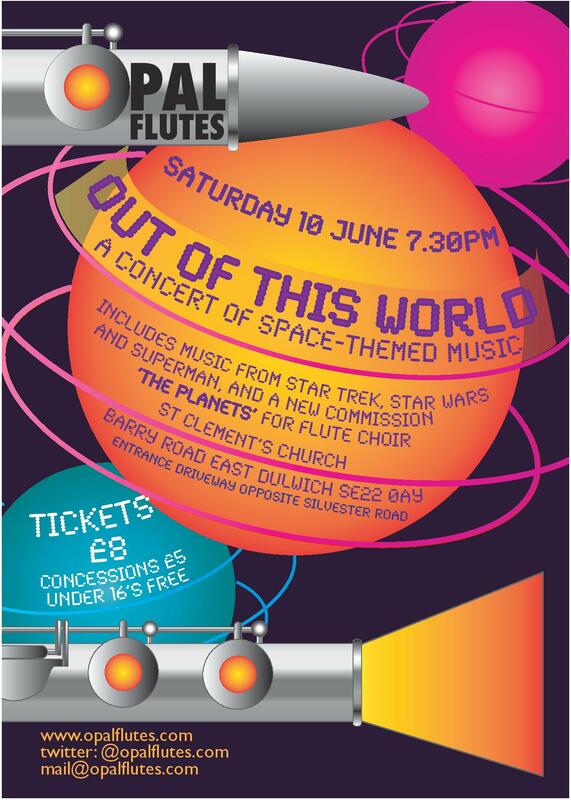 This concert was well attended and enjoyed by all. 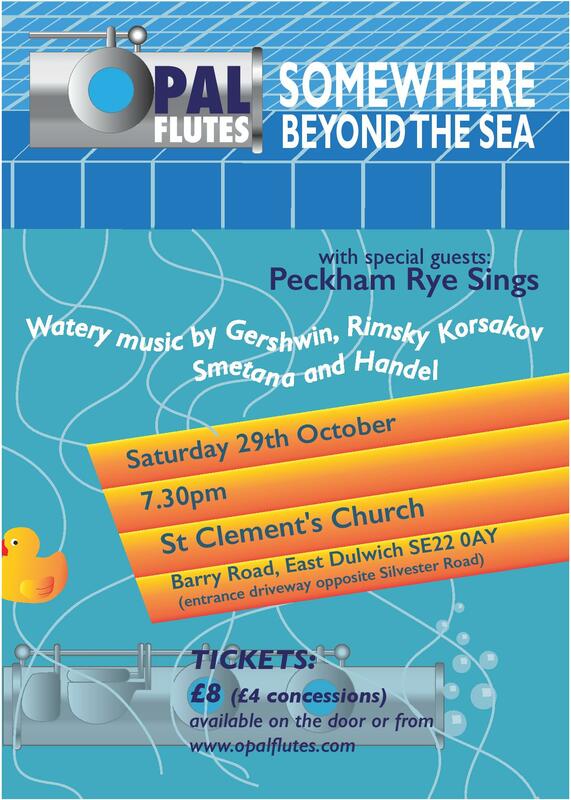 Saturday 28th November 2009 at St John�s Church, Goose Green, East Dulwich. Part of the Christmas Fair. We performed just before 'Magic Billy', a most amusing children's magician. Meantime Viola Quartet, The Ferndene Saxophones, Ian Finn's Double Reed Band, Swings and Slides Trombone Quartet and Magistri Malleorum Percussion Quartet. A very successful concert. Sunday 6th September 2009 - Outdoor concert at St Clement with St Peter's Church Barry Rd as part of the church fair. The music was well received and appreciated. 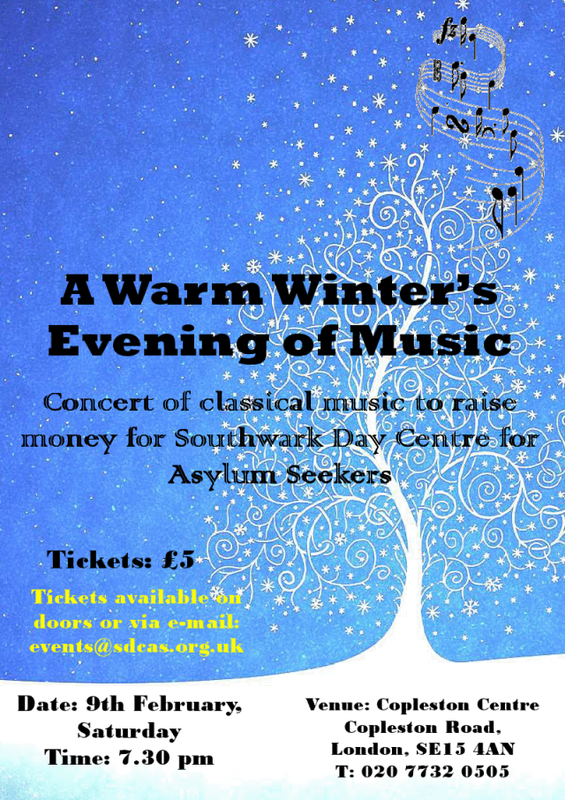 Saturday 31st January 2009 - Winter Concert at St Mary Magdalen Church, Bermondsey in aid of The Salmon Centre. This concert featured several local chamber ensembles, including The Meantime Viola Quartet, Ferndene Saxophones and the Consonum Ensemble. Nearly 300 pounds was raised. 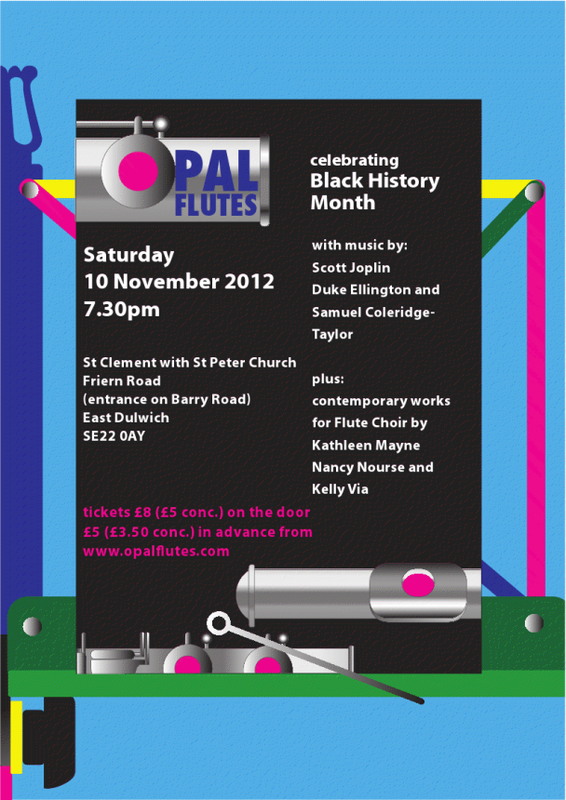 Saturday 13th December 2008 � Opal Flutes performed their first ever public concert at the Horniman Museum, Forest Hill. 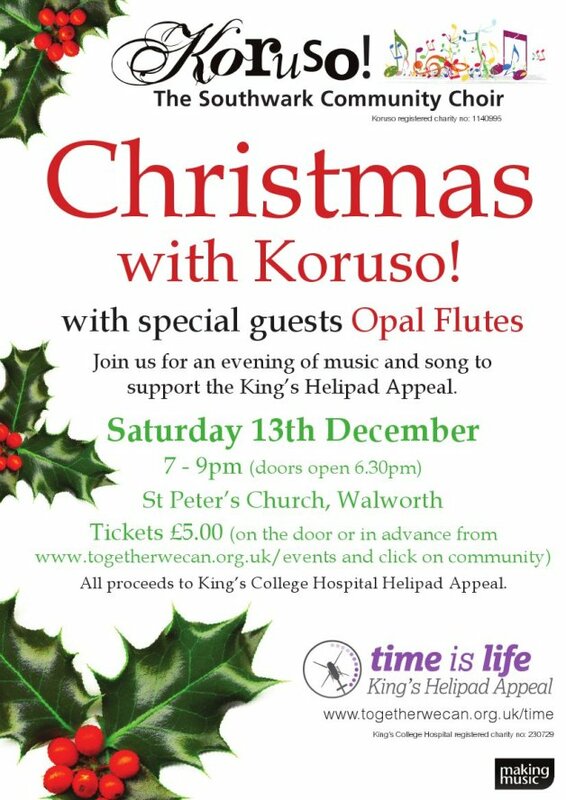 The programme featured a number of Christmas favourites alongside some more �serious� pieces by Boismortier and Corelli and was very well received by a healthy audience.